Russia and the former Soviet Union have an incredibly rich hockey history only bettered by that of Canada. But who is the greatest Russian ever? It's a question that is hard to answer because of the Cold War and the communists Iron Curtain politics. While many of today's fans will claim Sergei Fedorov or Pavel Bure or maybe Alexander Ovechkin is the greatest ever, it is almost impossible to determine Russia's greatest player from a Canadian's vantage point. While the top Russian and eastern European stars are now allowed to come to North America and pursue a career in the NHL, this was not always so. Not until the late 1980's were the top older players given permission to leave. Prior to that point the only time we saw the Russians was in major tournaments such as the Canada Cup and the Olympics. What we did get to see of them left us in awe of the immense skill and team work. While we have had a chance to watch such as Soviet superstars like Igor Larionov, Sergei Makarov and Viacheslav Fetisov, their best years were all behind the Iron Curtain. Those three get much consideration when discussing the topic of the greatest Russian players. Vladislav Tretiak of course also gets high rankings. However very arguably the greatest Russian player was Valeri Kharlamov, and we were almost completely robbed of enjoying his immense package of skills. Valeri Kharlamov played during the 1970's prior to the arrival of Larionov and Makarov and co. His skating was unequaled and his passing and shooting was simply uncanny. He perhaps had the greatest arsenal of skill of any player ever, maybe even more so than Gretzky or Lemieux, but we never had the chance to really determine that. One European hockey expert described Kharlamov as a combination of Mike Bossy and Pavel Bure. How good are his credentials? He won 2 Olympic Gold Medals, 8 World Championships with the USSR National team and numerous USSR league championships with Moscow Central Red Army. Whenever an NHL team would have an exhibition game against the Red Army, Kharlamov was a target of cheap and dirty play. They would brutally dominate the small Russian because they feared his ability. Stop Kharlamov from scoring was half the battle against the Soviets, the other half of course was trying to score against Tretiak. Of course, North American fans were introduced to Kharlamov in the 1972 Summit Series. Simply put, Valeri Kharlamov awed Canadian audiences. His slick foot and stick work and amazing speed and shot accuracy places him as perhaps the single most talented player in the entire tournament. Kharlamov was also feisty, leading the Soviets in penalty minutes with 16. Kharlamov's effectiveness was limited in games 8 due to a fractured ankle courtesy of Bobby Clarke. Had he been healthy....who knows? "I am convinced that Bobby Clarke was given the job of taking me out of the game," said Kharlamov. "Sometimes, I thought it was his only goal. I looked into his angry eyes, saw his stick which he wielded like a sword, and didn't understand what he was doing. It had nothing to do with hockey." Aside from the goaltender Tretiak, it was Kharlamov who impressed the Canadians the most. "He was fast, so hard to defend against out there," remembered Don Awrey, who was burned several times by #17. "I admired the way he used to come from behind and how he kept everyone on their toes. he was simply outstanding!" Canadians rarely got to see Valeri Kharlamov after that. He missed the 1976 Canada Cup due to injuries, and was taken from us far too soon. On August 27, 1981 he died from injuries that occurred as a result of a terrible car crash as he and his wife were returning from a summer's vacation. Kharlamov is survived by his son Alexander. Alexander was a first round draft pick (1994) of the Washington Capitals. Alexander was once considered a decent prospect but more of a defensive minded winger than a skilled player. He has spent most of his career playing the lower North American pro leagues, returning to Russia in 2000. "Bettered by Canada"?? What a joke! Soviet was much better than Canada with more trophys and more wins overall and best on best!! I'm proud that I was born in the same country as Valery Kharlamov!!! He is my favorite player forever! It's a big tragedy for ice-hockey history to lose the best player ever when he was only 33 years old.... :-( He will always be a role model for other ice-hockey players! Canada is the Hockey king, It is a beautiful place, and they play the Best Hockey, Kharlamov, Played Good, but that "Broken Ankle" was Soviet propaganda, he probably sprained it, besides what Clarke Did was in the heat of the Moment, because Kharlamov had Done some nice Stickwork on him, by Spearing him, which is way worse than a Simple Two-hander, and Far more Dirty. Don't Downplay what Canada could do, Bobby Orr Was Better than Kharlamov, so was Hull, but they couldn't play in 1972, because of injuries, and Hull Signed to the WHA. Canada was missing it real best. 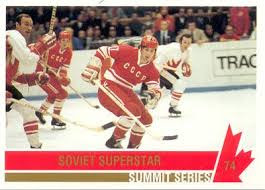 But who won the series ya Ruskies, Canada won even though the Soviets did Phone Calls in the Middle of the Night, Did lots of Spearing, kicking in the Shins (Boris Mihailov). Canada had way more Heart, that is why they won in 1972. Canada is the Best and Don't Anyone Deny it.